This Anchor Hocking 81574AHG18 1.5 Qt. glass mixing bowl is perfect for whipping up your signature recipes! Use it to quickly and easily whisk eggs, mix ingredients, and create batters, sauces, and dips for your bakery, restaurant, or catered event. With an ample 1.5 Qt. capacity, you'll have enough room to double recipes and make bigger batches. Great prep bowl. I have dropped this bowl and clanked it around I am shocked it hasn’t broken. Great size and I like the simplicity and how well they stack and store away. I have a set of glass mixing bowls, but they're more wide and shallow. Not conducive for good mixing. These are perfect! Deeper with higher vertical sides. Heavy glass. Came well packaged in bubble wrap. Exactly what I was looking for! I use these for baking sourdough bread on tiles. Reliable and heavy enough to trap steam. Customer service was excellent! I love these bowls! I’ve used them in my residential kitchen for a number of years and they are still in very good shape. They are nice and thick and pretty heavy. I stack 5 of them on top of each other on a shelf and they haven’t chipped or gotten stuck. Short of dropping them on the floor, I’ve never had one break. Because they are glass, they are microwave, dishwasher, and oven safe. They are so useful and inexpensive that it's well worth having extras on hand. I love this mixing bowl! I prefer glass mixing bowls because I can microwave them. I will definitely be purchasing more of these bowls in other sizes. 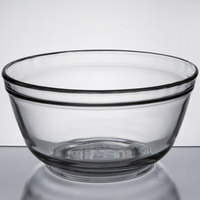 The Anchor Hocking 81574AHG18 is the 1.5 Qt and smallest of the 3 anchor hocking glass mixing bowls. It's a great size for mis-en-place of ingredients like flours, sugars, etc or small batch sauces, frostings, etc. As with anything Anchor Hocking, its a nice thick and consistent quality glass. The base is nice and flat and perfect for its intended purpose as a mixing bowl. It has a nice heavy weight to it which might be a negative depending on the situation. Overall its an excellent mixing bowl and deserves a spot in your kitchen. The price on webstaurantstore is unbeatable. Very good quality glass bowls. We do demonstration style cooking classes, so it is important that people can see our ingredients from a classroom style setting. These bowls are perfect. They are also great when taking photos for our social media page. Excellent quality for the price. For our smaller recipes we like to use these glass mixing bowls. They are really nice and easy to clean which is a plus for us. If you have a small kitchen, you must buy a few of these! I love this anchor hocking glass mixing bowl! Its a great size for small sauces. i use it all the time for double boiling, and its microwave safe too! Bought these bowls in all three sizes and they work well. Don’t heat up too much in the microwave I will definitely be getting more for our bakery. Love this bowl! Excellent quality for a great price! Can be used for many things, like mixing batters and icings or to hold fruits and vegetables. I love Anchor Hocking's products! These bowls are a nice, heavy weight. They stack with other sizes and are great for everything! I have several sizes. I love anchor shocking glass mixing bowls. It is great quality. This one is 1.5qt. Not only are they functional they look nice and are a thick heavy duty glass. This is a smaller bowl great for whisking salad dressing in but I am sure I will find many other uses. I love the thick glass and it feels like great quality. I just adore Anchor Hocking products. This is a great durable product that is easy to clean and definitely usable to mix literally anything that needs mixing. We have used it to mix a variety of things in our restaurant. Great bowl. I would recommend getting all three sizes since they nest inside of each other. Or multiple of the same size if you so desire. They are sturdy, and I especially use glass bowls when mixing more acidic products. I heard stainless steel doesn't do too well in acidic environments. Good glass bowls. I bought this size to accompany the other three sizes to make a set. They are sturdy and do have some weight to them. Glass is always better then plastic.! A high quality product that is made well and is very durable. Perfect for melting dipping chocolate in the microwave for my dipped berries. The Anchor Hocking brand is awesome and would highly recommend these bowls for numerous uses. The anchor hocking 48oz bowl is a great size and is very useful. It is a heavy thick glass with tall walls. I use it often as a double broiler bowl. These are good bowls. I like the Anchor Hocking brand. They are heavy enough to be sturdy but not so heavy that they are a drop hazard. They are well made and clean easily too. I love this Anchor Hocking Glass Bowl! The size is perfect for melting a decent amount of chocolate on a double boiler Looks to be great quality! Great price! Great for microwwaing items that may normally melt a plastic bowl, we easily make chocolate ganache with this glass bowl, and it causes no damage. Love these mixing bowls! They're great quality glass. I can microwave them for a long time without worrying they'll break. They all stack pretty well on top of each other. Glad I bought a few. This Anchor Hocking glass bowl is solid and is used every day. Easy to clean and looks good so that it can be placed on the table. This is the third size of Anchor mixing bowl I ordered in my last order, and believe it or not they are excellent and I have used every one of them! This is a very nice quality glass bowl. I use it for making ganache and for melting chocolate for cake pops. It is heavy duty and has held up well. These are great mixing bowls. I love the heft of the glass and the size is nice for smaller ingredient combinations. Mostly used at home but also some in the restaurant. The glass is nice and thick. It does not tip over as it has a sturdy bottom. Very good quality and priced right. High quality glass which won't get cloudy! Perfect for small jobs like salad dressing, sauces, or eggs. Nice, thick glass. Mine did arrive damaged, however, it was no fault of the item. It was packed with some other really heavy things. Quick to fix and get a new one out! I have so many bowls and finding the right small bowl for the job can be annoying especially when the bowl is a wide as opposed to deep for mixing smaller amounts. This size is just great - does it's job and has a nice weight. This bowl is not just a mixing bowl but i have used it to bake in, and holds up to the heat just fine. The bowl is a nice deep and soild bowl when i do use it for mixing. Like other reviewers, I simply don't understand how the prices are so low. This 1.5 qt bowl is versatile, microwave/dishwasher safe, and practically indestructible (I say this because I've used mom's OLD set for years). This is a great little size with many uses. this bowl finally arrives today and I couldn't wait to use it, well it is microwave usable and the price is not bad. I made a small dough with it and baked my small Italian bread. I am happy - worth the money. This is a great bowl, but it is a little smaller than it looks in the picture, so it is great for melting chocolate in small quantities in the microwave. I love this mixing bowl! its perfect for mixing your dry ingredients when making a cake. Its also great for serving things like fruit salad on the table tops. I dont understand how these bowls are so cheap. Mine showed up with 0 defects, and were of surprisingly good quality. Every kitchen needs a full set of these glass mixing bowls! First I have got one of this. After using it in my bakery ones, I ordered 2 more of the same size. I use it to mix all different small amounts of icing. I like it because it is glass. Purchased this Anchor Hocking 1.5-qt. glass mixing bowl for use as a double boiler to melt chocolate. Works like a charm! Will be back for more of these in different sizes. Easy to clean, great value. These bowls are the best! We have several of these in our kitchen, in a variety of sizes, and use them almost every day. My favorite mixing bowls by far. This is a great glass mixing bowl. Just the right size for smaller preps. The sides are steep so works great with hand held mixers. Plus Anchor Hocking is a quality brand so this should last a lifetime. These mixing bowls are perfect for smaller recipes. The glass is thick and well made. I know I will be using this a lot from now on. This 1.5 quart mixing bowl is good for making fresh whipped cream and quick tempura batters! Nice size bowls for preparing items and setting up mise en place!! !